INDEPENDENCE — With the 25th anniversary of Manzanar becoming a National Historic Site coming up on March 3, 2017, and with the much more significant anniversary happening just a few weeks prior — the 75th Anniversary of President Franklin D. Roosevelt’s signing of Executive Order 9066 — the Manzanar National Historic Site is working to bring two new exhibits online. Work is in progress on a classroom exhibit, which will be housed in the Block 14 barracks. Also in the works is the construction of a historic replica of the Block 14 women’s latrine, with some exhibit material coming after construction is completed on the structure. 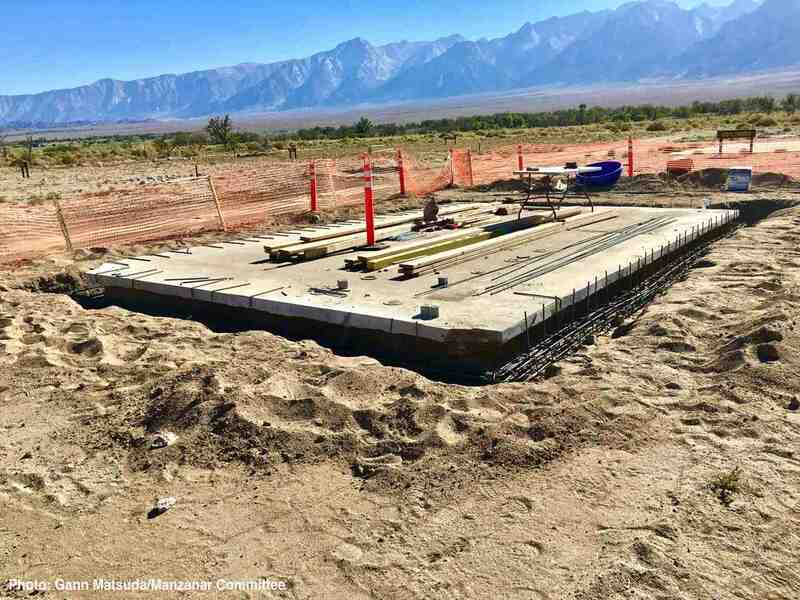 The latrine will join the barracks and mess hall exhibits in Block 14, Manzanar’s demonstration block, located within walking distance of the Visitor’s Center. As of Sept. 14, work to reinforce the historic concrete slab foundation was under way, with rebar being installed. The structure is expected to be completed in October. Indeed, the latrine is likely to become one of the Manzanar National Historic Site’s most powerful, most thought-provoking and most educational features. “The guard tower and the latrines are things — when we do oral history interviews and we ask people, ‘What do you want to see at Manzanar, what do you want visitors to know, what do you want visitors to understand,’ the latrines and the guard towers come up over and over as something that people will never understand what endured here until they see the conditions, so I think it’s an important structure,” said Manzanar National Historic Site Chief of Interpretation Alisa Lynch. To be sure, the demoralizing, dehumanizing experience the incarcerees faced when they had to use the latrine, which was also a cultural affront to them, was burned into the minds of every incarceree and it is a memory that continues to have an impact on them nearly 75 years later. Visitors who served in the military might think that rows of toilets without partitions isn’t a big deal since that’s what they had in their latrines — the Manzanar latrines were based on those found at military bases. But Manzanar wasn’t a military base. These were civilians. Women were especially impacted by the lack of privacy in the latrines, given the fact that most women had more than just the routine bodily functions to deal with in the latrines. Twelve historically accurate toilets have already been acquired. The latrine itself will say much of what needs to be said to visitors. With staff focused on completing work on the classroom exhibit, there is no projected completion date for the latrine exhibit. Gann Matsuda, who writes from Culver City, is the editor of the Manzanar Committee’s official blog. Just want to tell you that Muratsuchi is very handsome.